What is a necromancer? When discussing this book to friends or family (because sometimes I can't help but talk about the books I read, even if they're not interested), this question came up quite frequently, and it baffled me. I thought, 'Who doesn't know what a necromancer is?' And then I'd have to explain each time what a necromancer was. So, if you don't know what a necromancer is, never fear, because I am here to explain it to you. A necromancer is a person that has the power to raise the dead. Now, to the review. When it came time for the Fall Fierce Reads Book Tour, I saw that the sequel to this one was on the list. Curious, I set out to find the first book and read it and all that jazz. The concept sounded very creative and interesting and the cover, the original cover, is something of a beauty. (If you were wondering, the cover featured above is not the original cover). Plus, it had that little metal award thing. That had to count for something good to come out of this book, right? The story itself was dark and morbid, but extremely fun and entertaining to read. Sam meets Douglas in an unfortunate event and things all spin off from that. Being that this book is about necromancy, I was super glad to see how dark and twisted the plot turned out to be. And I'll tell you this now: McBride was not afraid to bring the ax down on characters. My only complaint would be the lack of imagery. Things would get confusing every now and then and I'd have to reread sentences to decipher what was going on. It wasn't that big of a deal, but it bothered me at times. 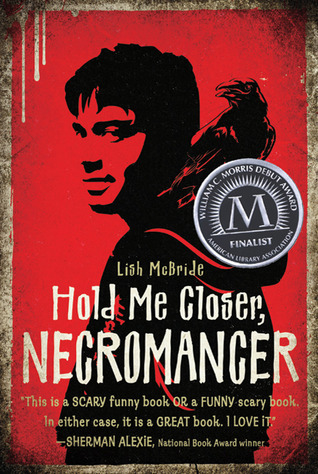 Hold Me Closer, Necromancer is about a loser, dropout turns super powerful being of necromancy boy that ends up not only surprising himself, but myself included. I fell in love with him easily with his attitude and sarcasm. Also, McBride taught me that it is not the people that can raise the dead I should fear, but those who wield their power the wrong way. Who knew that I could love a necromancer? Fans of all things supernatural, dark, and dead will enjoy this book. So I was just wondering if I should pick this book up, since I just saw it on somebody's StS post, and was complaining about the lack of recent blogger reviews about it. And voila, here pops up your review. FABULOUS timing, I must tell you, Millie dear. But anyways, you've whole-heartedly convinced me to pick this one up! I love how Sam is just an average guy, who keeps his friends throughout the book, because I've seen too many characters drop their friends, like you said. He also seems easily relatable, and I lurve characters with some snark! ;) I think I'd fall in love with him instantly. Even with the minor qualms you had with it, I'm totally going to be grabbing this book from the library next time I go. Sounds good! I would never have picked this book up if I hadn't read this review- I judge books on their covers far too much! Thanks for sharing! And.... *ahem*.... I must admit, I didn't know what a necromancer was either. Yeah. I'd heard the word before, but, um, didn't know what it meant. While reading your post, I felt like the kid in the classroom who tries to PRETEND she knows what the teacher is talking about, just so she won't look like a complete dunce to all the other students. Haha! ( : I suppose my confession will now blow that sparkling image everyone has of me... doh! And p.s. You now have a new blog stalker, on account of, I've been scanning your books here, and haven't read most of them.